Today was Day #4 of Crunchy Chocolate Theme Week. 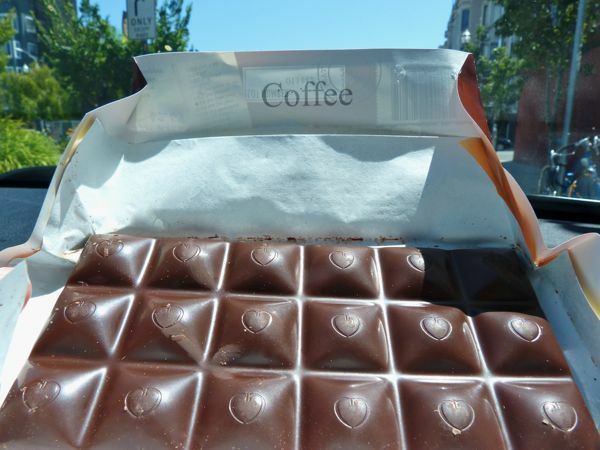 The crunch in this coffee flavored dark chocolate (55% cocoa content) bar was provided by ground coffee beans. The particular grind provided just the right amount of texture: not too fine, and not too gritty; it was just right. The 55% chocolate in this chocolate crunch combination was just right as well. It was smooth, not too dark, and not too sweet. 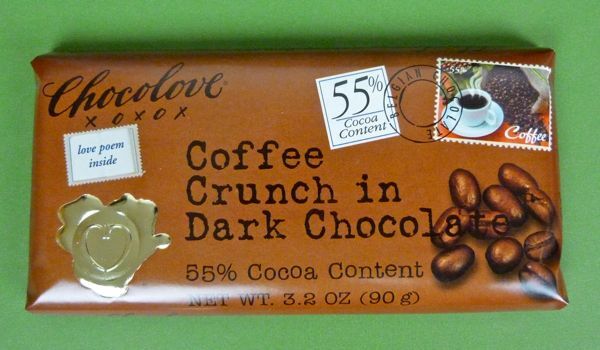 This Chocolove (Boulder, CO) bar was a good value at $2.69 USD for 3.2 oz. (90 g.). As an added bonus: inside each wrapper was a free love poem. In this case it was a Shakespeare Sonnet. 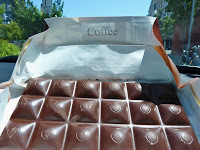 This Coffee Crunch bar was also one of the better coffee bars I've tasted in quite awhile. I'm melting the last bit of this and eating it over vanilla gelato for dessert tonight.